I heard this speech a few days ago on Shakespeare and was quite taken with it. It dispelled my suspicion, fueled by years of eminent doubting Thomas’s, that the lowly theater-owning businessman could possibly have authored the plays. It took a Jeopardy champ to convince me they were wrong. I hope I find a transcript. I got a letter today from someone who thought I looked crooked in my Budgeteer Photo. Here and Here. So, I’m going to display some photos over the next couple days that show the real me. 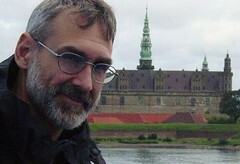 Here I am two years ago on a ferry passing Hamlet’s Elsinor Castle in Denmark. (You remember him. He couldn’t decide whether to get the bad guy or not. I understand Hamlet but I also remember that the bad guy got him. Reminds me of me and JCI) I still have a beard in this photo although at the moment I’m beardless. I’ll get around to showing some more current photos too. “As a 55 year old man I have no intention of getting a tattoo but both my children sport them. My daughter has a little one on her scalp which reportedly means “hair” in Chinese. Once her hair grew back it became invisible. My son has them all over his torso.I’m actually a little comforted to read that so many people have them now because I don’t wish either of my children, or my tattooed son-in-law, to be penalized for their body art. Still, I’m not a fan.